Justin is a moderate but substantial boy with very dark eyes, round bone and fantastic feet. He's is one of the few dogs who is clean coming and going and yet still shows great reach and drive in his sidegait. He's got a fantastic work ethic and is both a quick learner and eager to please. Justin joined us from Fiacre Dalmatians in Reno, NV. 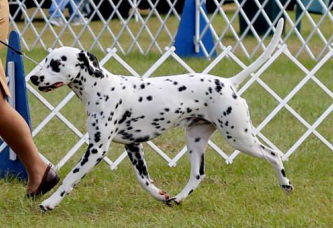 His mother Selia (Fiacre Seeing is Believing) is one of a very few homozygous normal Dalmatians for the Normal Uric Acid Gene. Justin is Uu or heterozygous and so approximately 50% of his pups will also carry the normal gene. Dixie is from our New Zealand sired litter and is the perfect little package. Dixie lives with the Rodney and Debbie Dixon and their three kids and is a frequent participant in their camping trips. Her elegance, effortless movement and grace when combined with Justin's substance and form, should produce lovely pups with super personalities. Dixie has been a super "surrogate mother" to Sam's bunny so we anticipate that she'll be great mom too!